Green is the new black” – at least it is if you’re referring to the Eco UV Bar from American DJ. A high-power one-meter ultraviolet bar, the Eco UV Bar is -- as its name suggests -- an eco-friendly black light that uses long-lasting, energy-efficient LEDs as its light source. Equipped with 18 1-watt ultraviolet LEDs, the Eco UV Bar produces a bright, powerful UV wash that’s equivalent in output to an 80-watt unit. Providing wide coverage, it’s ideal for adding an ambience-enhancing black light glow to any performance stage or venue. Yet despite its brawny output, the Eco UV Bar’s efficient LEDs draw a mere 26 watts of power, saving on energy consumption and electric bills. And since its LEDs run at a much cooler temperature than conventional lamps, it can stay on all night without overheating. With its LEDs rated at 100,000 hours, you won’t have to worry about changing lamps either, which means less environmentally un-friendly waste to dispose of. The fixture’s long lamp life, and the fact that it contains no moving parts, make the Eco UV Bar virtually maintenance-free. 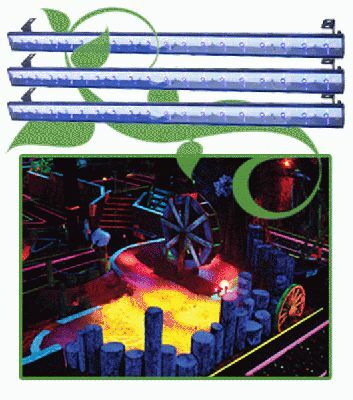 It’s ideal for performance stages, theatrical productions, bowling centers, skating rinks, laser tag and other special effects installations where the glowing aura of a black light is desired. With fall right around the corner, the Eco UV Bar is perfect for adding a “ghostly touch” to Halloween parties, haunted houses, and other spooky events, pointed out Scott Davies, General Manager of the American DJ Group of Companies. “Everyone can use a black light, especially at this time of year,” said Davies. “The Eco UV Bar is great for creating a ‘scary’ effect at installations such as haunted houses, where it would be required to stay on for long periods, because it can run virtually unattended with no maintenance requirements, without overheating, and at a very low cost to the user. Another advantage of the Eco UV Bars LEDs is that they will not fade over time, but will keep producing their strong, bright output over the course of the fixture’s long life. This makes the unit a very smart investment for any lighting toolchest, Davies noted. Featuring a 120° beam angle, the Eco UV Bar includes versatile hanging brackets that allow it to be mounted on the wall or ceiling, or set on the floor for wall washing. It also comes with a convenient On/Off switch on the rear panel. Another handy feature is multi-voltage operation: 100V-240V AC, 47/63Hz. The one-meter bar measures 39.5”L x 2.5”W x 4.5”H/ 1000 x 60 x 110mm, and weighs 5.3 lbs./ 2.4 kg. The MSRP of the Eco UV Bar is $209.95.